Every month, we tally our customer reviews from dressage riders like you to find our customers’ favorite products. With 78,000+ reviews, we think it’s hard to beat the insight from our own customers. 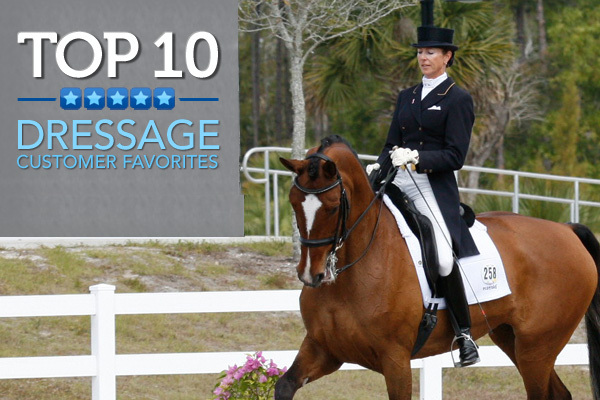 Check out this month’s Top-10 Dressage Products to find some great picks for you and your horse. What We Say: Slow down! Some horses eat too fast, or sometimes you need to extend the duration of their meal. Our SmartPak Slow Eater Hay Bag is a durable nylon hay bag with nylon mesh hole designed to slow down hay consumption. Perfect for trailering or use in the stall. 28″(H) X 22″(L) X 8-1/2″(W). What We Say: Is your conditioning program coming up short? Lean muscle development requires the right support! SmartMuscle Mass provides 12 amino acids as the building blocks of muscle tissue. Gamma Oryzanol, Creatine, HMB, Collagen, Betaine and other targeted ingredients are also included to assist the normal muscle-building process. Strong, defined muscles start with SmartMuscle Mass! What We Say: FITS most popular breech and for good reason. FITS patented PerforMAX™ full seat technology gives you the most comfort and best performance ever offered in a full seat breech. You will love FITS All Season Microfibre fabric with both wicking and warming properties to keep you cool in hot weather and insulate you in cold weather. What We Say: Following the success of the Plymouth line, SmartPak is proud to introduce the Plymouth Elite. The Plymouth Elite takes all of the wonderful features of the Plymouth line and adds additional enhancements such as a true padded monocrown, buckle closures, 1″ wide noseband and rubber lined leather reins. Offered with plain noseband and flash or crank noseband with no flash. What We Say: SmartCanine Senior offers targeted support for the most age-susceptible organs of the senior dog. Scientifically developed to help maintain health throughout the body, it includes 250 mg of glucosamine, 100 mg of chondroitin, 10 mg of HA and 250 mg of MSM for joint maintenance; taurine for a healthy heart; milk thistle for a normal liver; DHA for brain function; and lutein for eye tissue; as well as antioxidants for overall cell health. Consider beginning the supplement just as dogs enter their senior years. What We Say: An everyday favorite! Easy care (100% washable!) and quality construction. Equifleece lined for chafeless comfort, a favorite for both schooling and showing. Elastic on both ends to equalize girth pressure. Stainless steel roller buckles. Nylon reinforcements. What We Say: Stephen Colbert has declared Dressage the “Sport of the Summer” and we’re your source for the official SmartPak/USEF foam finger. Whether you’re a jumper, reiner or a weekend trail rider, everyone can appreciate the art of “competitive horse prancing.” So get yours now and show your pride! What We Say: SmartPak Lined Stirrup Leathers are lined with Nylon to prevent stretching. Covered with soft leather, requires no break in time! The SmartPak Lined Stirrup Leathers measure 7/8″ wide. Holes spaced .75″ apart. Stainless steel roller buckle. What We Say: The Mountain Horse Victoria Top is a lightweight microfiber high-tech competition top with a crisp clean white cotton collar for an updated polished look when competing.